When opening a scene (or an external layout), the scene editor opens. 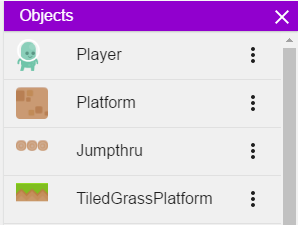 The Scene Editor is where you can design and build your game levels, your menus, your inventories or anything else that your imagination inspires. The Scene Editor allows you to create and add objects to the scene/screen. Gameplay and rules of the game can be created using events in the Scene's Events Editor. There are a number of tools and editors available on the scene editor's top toolbar. You will find the Objects Editor on the right side of the Scene Editor's interface. This is where you can see all of the objects used in your scene. You can also add new objects using the Objects Editor. Read about the generic features available for all objects and then look at the help about the objects types to learn more about the different kind of objects that you can use in your game. You can find the Object Properties editor on the left side of the Scene Editor's interface. If the Object Properties Editor is not visible, close the Project manager. Then, select an object in your scene. The Object Properties Editor panel will open on the left. Using the Properties Editor allows you to change the properties of the selected scene object. 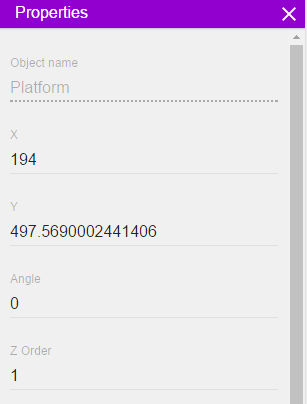 Such things as an object's position, scale, and Z-order can be changed using the Properties Editor. You can read more about properties of objects on this page. Note: GDevelop panels can be moved by dragging them to any place that you would like. Simply drag the panel using the title bar. As an example, if the Object Properties Panel opens on the right side of the screen and you would rather place it on the left side of the screen, simply drag it into place using the title bar. 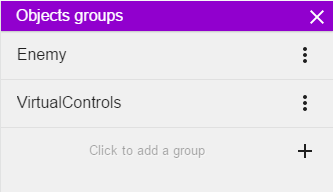 In the Objects Groups editor, you can find the list of groups of objects that are present in the scene. Object groups contain objects and can be used in events to refer to multiple objects, using a single event. Read more about them on the page about common features for all objects. The instances editor displays the list of all of an object's instances living in the scene. It can be used to select any instance from the list to see the instance's position, angle, layer and Z order in the scene. 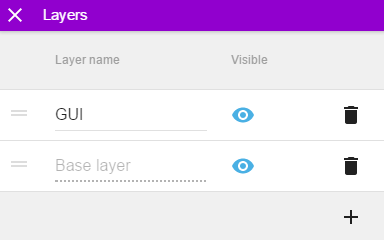 By default, each GDevelop scene comes with a single layer called the “Base layer”. This is where all objects are located in our scene. We can add more layers for various purposes and put any instance on any layer. For example, there can be a layer to display controls on the screen. There can be another layer to display a menu. Yet another layer can be a game map, or a background. 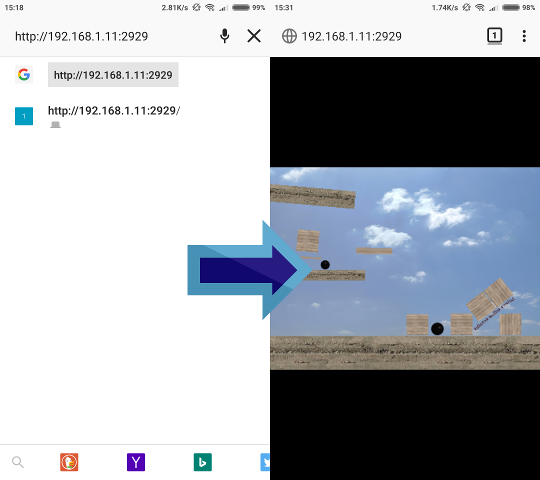 The layer editor displays the list of layers in the scene and allows you to add new ones, change their order, toggle their visibility on screen or remove them entirely. Toggle mask: this option displays or hides a black border on the scene. It represents the size of the game window. Toggle grid: this option turns the grid off or on within the scene editor. Having a grid is useful when we need to place objects accurately. Setup grid: this option opens a window that allows you to setup the size and position of the grid. By clicking on the Preview button, you can launch a preview of your game! The preview will open in a separate window. Note: You can close the pop-up window in the editor and continue to edit your game. If you launch a new preview, the mobile devices and any connected computer will automatically refresh the game to show the changes made! The Debugger is a tool that can be used to inspect the content of your game (values of variables, existing instances and their properties…) and even do some real time editing. See this page to know more about using the Debugger.